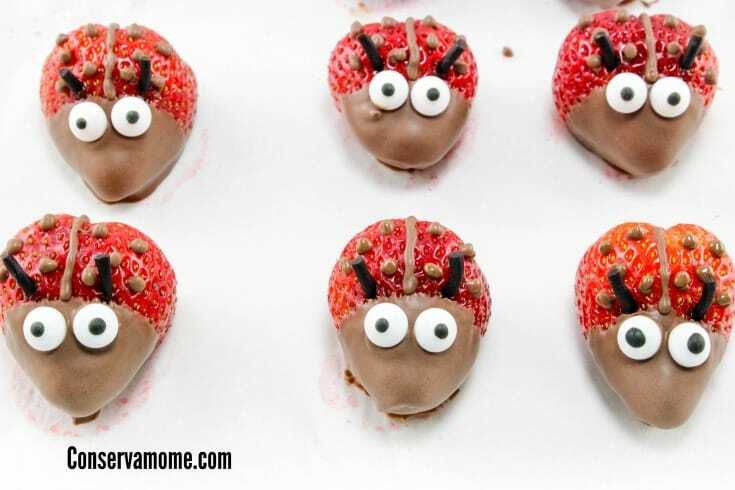 Chocolate Strawberry Ladybugs – Easy & Fun Dessert Idea! 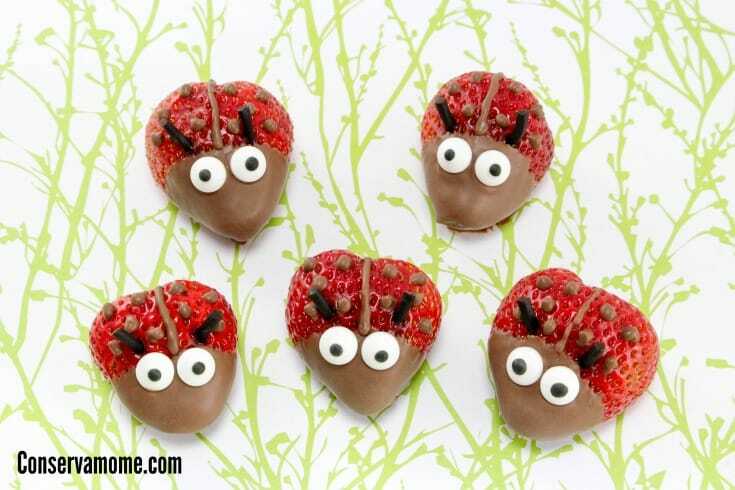 Here’s a fun dessert idea that combines chocolate and strawberries into delicious Chocolate Strawberry Ladybugs. These easy to make little treats will be the hit at any event or gathering! I love fun themed dessert ideas. I love them more when they’re easy to make. 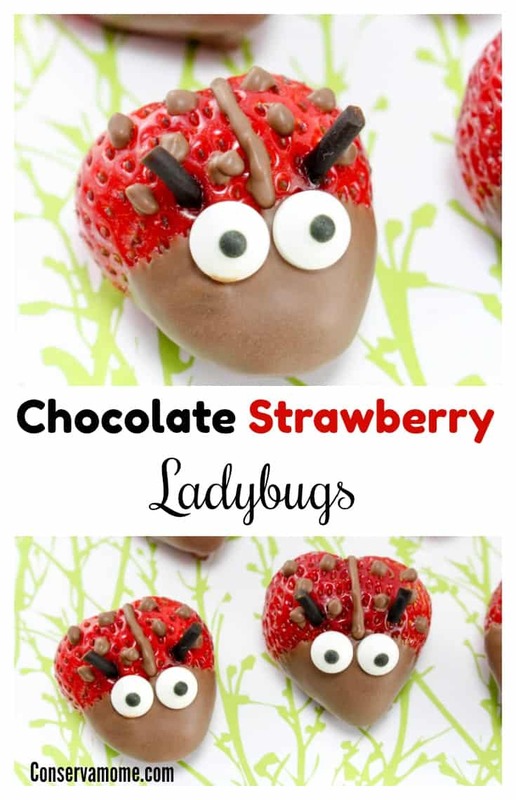 There are fewer things that are cuter than a ladybug dessert and well this dessert is a trifecta because it incorporates 3 of my favorite things, Chocolate, Strawberries & Ladybugs. The best part is that it’s so easy to make with minimal ingredients and most important minimal work. However, the product is a gorgeous ladybug that is out of this world adorable! I can’t believe how cute it is and how delicious it is to eat (although you might not want to because of how perfect they look) These are perfect for a summer gathering, spring fling or just because! Use them for a birthday party or even a picnic. The sky is the limit! Best of all you won’t break a sweat making them! 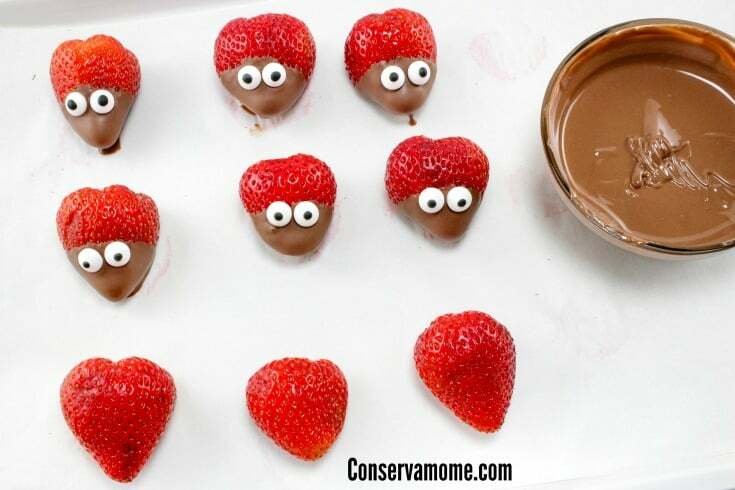 Cut the stems off the strawberries and cut a small sliver off the bottom side of each berry so they will lay flat. Melt chocolate per package directions. Dip each berry into the chocolate coating about a third of each one. 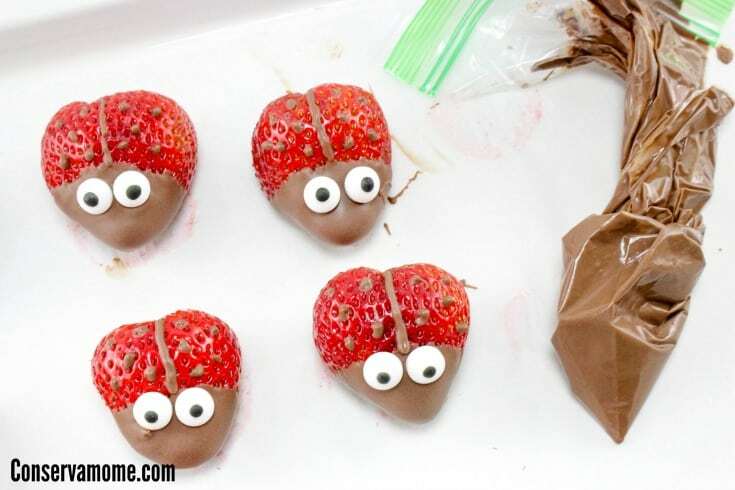 Place 2 edible eyes on each dipped berry and let harden for about 5 minutes. 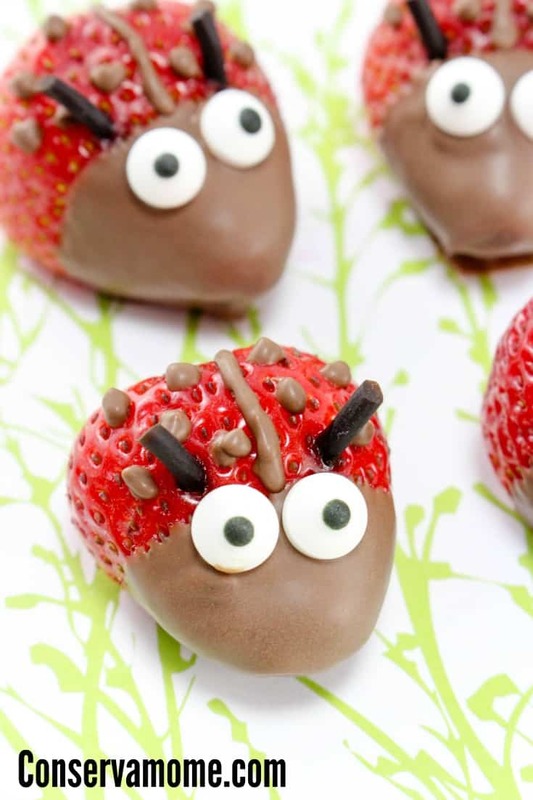 Place the rest of the melted chocolate into a small plastic baggie and pipe a line down the middle and little dots all over the top to resemble a ladybug. While this chocolate hardens, cut tiny ½ inch pieces of licorice. Poke two of these into each berry, one above each eye to resemble antennae’s. Looking for more fun ideas? Check out 20 delicious desserts on a stick, or How about some Summer fun cookies? Such a cute snack! They would really make adorable cake or cupcake decorations for my niece’s birthday. We are always looking for different treats to prepare the grand kids…and me!! I got to try these for my grand son. I made some like baseballs for his 1st Birthday! He’s moving back here in about six weeks and it would be a neat surprise for him! My granddaughter adores ladybugs and we have done different variations on snacks. This will be another fun one. The kids sure would love these but as a dad, I am really not too talented and seem to be all thumbs when it comes to this type of creativity. Sure like them though and maybe something fun for the kids to do with me. This is such a cute and easy idea. Perfect for summer. 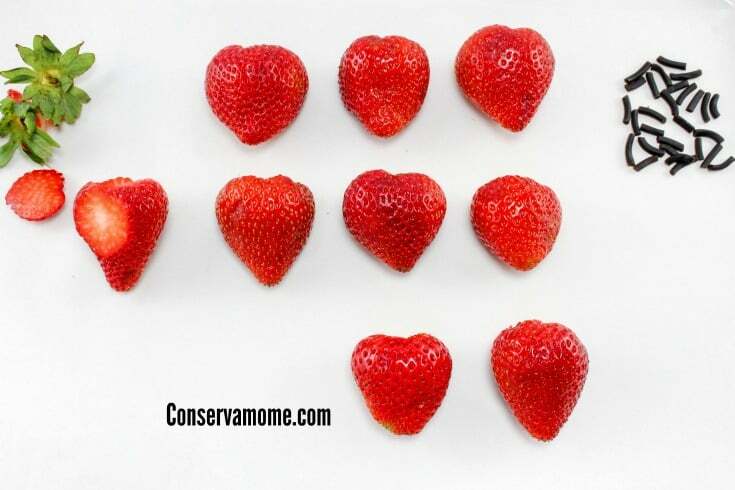 I wish my hubby liked strawberries. This is sun a fun idea, thank you so much for sharing! These would be perfect for a birthday party, or even just for fun! My kids would absolutely love them. 🙂 Thanks for sharing!